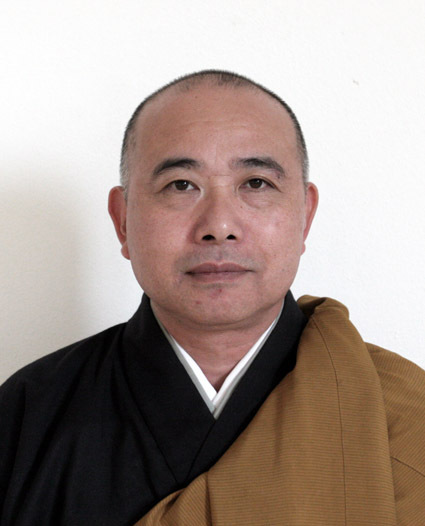 Tetsujyo Deguchi,Abbot of Toshoji International Zen Center and a seminal influence on the growth of Zen Buddhism in Italy. He was ordained as a Soto Zen Monk at the age of thirty,but started zazen at the age of sixteen. He studied law in Chuo University while staying at Toshoji temple. He received Dharma transmission and also Dharuma success(1983 Inka) of Harada Roshi Line from Ban Tetsugyu Roshi(1910-1996). Ban Roshi was born in Hanamaki city (Iwate prefecture) June 4,1910. He was ordained as a Soto Zen monk by Fuchizawa Chimyo Roshi July 9,1917, and received Dharuma transmission from him. From 1931 till 1938, he practiced in Hosshinji temple.He became a student of Komazawa university in 1938 and graduated in 1941. After the war he became a"tanto"of Hosshinji in 1947, and also a "tanto"of Hoonji (Iwate prefecture) in 1948, and became a master of Toshoji. He received Dharuma success (Inka) from Harada Roshi. He established two temples in Japan,Kannonji (Iwate) and Tetsugyuji (Oita). He retired from Toshoji on May 10,1992 and died Jan, 21, 1996. He was 86 years old. Harada Roshi was born in Obama city (Fukui prefecture) Oct,13,1871. April 8 1883,Harada Roshi was ordained as a Soto Zen monk by Harada Sodo Roshi who was a master of Bukkoku-ji temple, and received Dharma transmission from him Mar,8,1895. He studied in "Soto-shu Daigakurin" (now Komazawa University) and graduated July 1901. After graduation he studied Zen from many masters,Soto-sect Akino Kodo Roshi Oka Sotan Roshi Hoshimi Tenkai Roshi Adachi Tatsujun Roshi and Rizai-sect Unmuken Taigi Sogon Roshi(master of Ibuka Shogenji) Kogenshitsu Dokutan Sosan Roshi(master of Kyoto Nanzenji). From 1911 till 1923, he was a professor of Soto-shu Daigakurin. He became a master of Hosshin-ji temple in 1924, and also served as the master of a number of other temples. (Chisai-in , Ankokuji, Hoonji, Chigenji). He retired as master of Chigen-ji in 1937, and lived in his hermitage "Kakusho-ken" after retirement. He died Dec,12,1961 in Kakusho-ken. He was 92 years old.